Riveting. What a story: cyber-warriors, China, Chinese cyber-warriors, corps of Chinese cyber-warriors — put it all together with the vague but threatening “growing corps” and you have quite the alliteration, which we should still juxtapose to our historical invocation of Yellow Peril, so I say be careful. After the internationally best-selling trilogyGirl with the Dragon Tattoo, not to mention all the films that emerged in Swedish and English, we all have hackers on the brain now. Whether by a rogue agent, as with Skyfall, or a rogue nation-state, this is serious stuff. And it’s serious stuff that I’ve experienced. But then, if you look closely, most of us have experienced it. The question is this: Do you know it? Was it for war or for profit? Most people have, though they don’t know about it. (Who knows their balance to the penny? But most of us have had our ATM cards go out on us when the bank freaks that it’s not you — when you use your card to buy a train pass, for instance, in Penn Station, where I for one have commuted for 20 years and only now get cut off?) Not only did David Sanger’s excellent book Confront and Conceal spell it out on the cyberwar front, but a former Bush administrator had a book that got me to pay attention, and then there was the Obama administration’s report. It synced, in other words, with my own consciousness. This former Bush official said it best with his phrase that I heard on an NPR book show (Leonard Lopate or Terry Gross, I’m sure). And that is his point that internet activity — malware, hacking, stalking, harassing — is best compared to an STD. Then when you’re ready to face the day and you have a WordPress page, download Google Analytics and this will show you exactly how well we can track each other, never mind about corps of cyber-warriors in China. Start with who is tracking you at home first. And remember to be a bit generous about our “enemies” abroad. 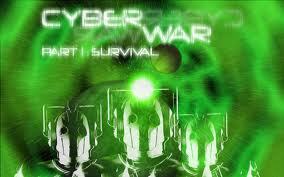 I myself take a bit of offense at the term cyber warrior. When I had tendinitis (carpal tunnel syndrome), I knew a number of New York Times editors, and our common doctor called them and me “typing athletes.” I tell my family this whenever I want to hear laughter. But, seriously I do think we should be careful about what we call such a large non-rogue nation; we should always hope to keep coming to the table. After all, Nixon did it, so why can’t Obama? And we can rest assured, he will try.